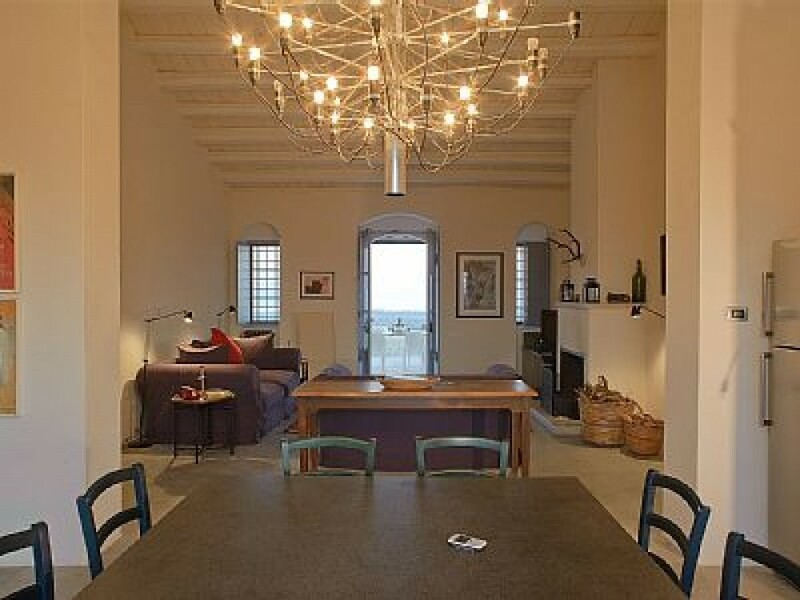 The inside of the villa spreads over around 190 sqm and consists of 4 double bedrooms, of which 2 have sea view. There are 2 bathrooms both with bath tub and shower. The kitchen is well equipped for family living with ample pots and pans, glassware, cutlery and crockery to entertain 12+ people. There are baby and children's plates and cups too. There is a large fridge freezer, dishwasher, gas hob and oven. The utility room has a washing machine, sink and further storage. There is a stocked larder of various essentials including water, wine and beer. There is also a large vat of our own olive oil for guests use when available. The open plan living room has full height ceilings, a large fireplace, 2 large sofas , ceiling fan, flat screen TV,DVD and an ipod ready hi fi. It opens out onto the main terrace overlooking the Nature Reserve and Mediterranean sea beyond. The design of the house allows good cross ventilation keeping it cool and fresh. There is a cupboard area off the sitting room with classic films, DVD's, CDs, books and games. There is also a travel cot, pushchair and buggy available. The house and pool are surrounded by 5m terraces which have been planted with lavender and santolina. It is still quite a recently built property and we are slowly landscaping and planting around the house. There is an outside table with chairs that seats 12 and a table, chairs and loungers around the pool area. There is a large shaded area on the sea view terrace and an outside BBQ and cooking area and outside shower. There are permanent washing lines out of sight from the house behind the BBQ area. The property sits in its own 10 acres of private land and has its own small vineyard running along the side of the property. $ The balance and a fully refundable � 300 deposit (held against damages) is payable a month before arrival. There is a one off � 100 cleaning charge per stay.